For ladies some where between the range of kitten and cougar. 1. Thoroughly chill a martini glass in the freezer. Begin testing the shell chocolate syrup to make sure it is not going to dump into the glass rapidly. I recommend that you NOT pour from the bottle. Instead, use a tablespoon and fill with shell syrup for better controlled application. Now begin applying chocolate shell syrup randomly to the inside of the chilled glass. You may have to move the glass in different directions to achieve the irregular spots of a leopard. Return the glass to the freezer to keep it cold. 2. This should be done a day in advance of your party so the spots can carefully be applied. My shell syrup went rogue and I had to apply the Smuckers brand shell syrup slowly and chill in between each section’s application so it didn’t just run all over the inside of the glass. 3. Fill cocktail shaker with ice and combine the vodka, rum mango nectar and candy syrup. 4. Shake well until the shaker is too cold to hold. 5. Strain the contents into the prepared glass with spots. Ta-Da! 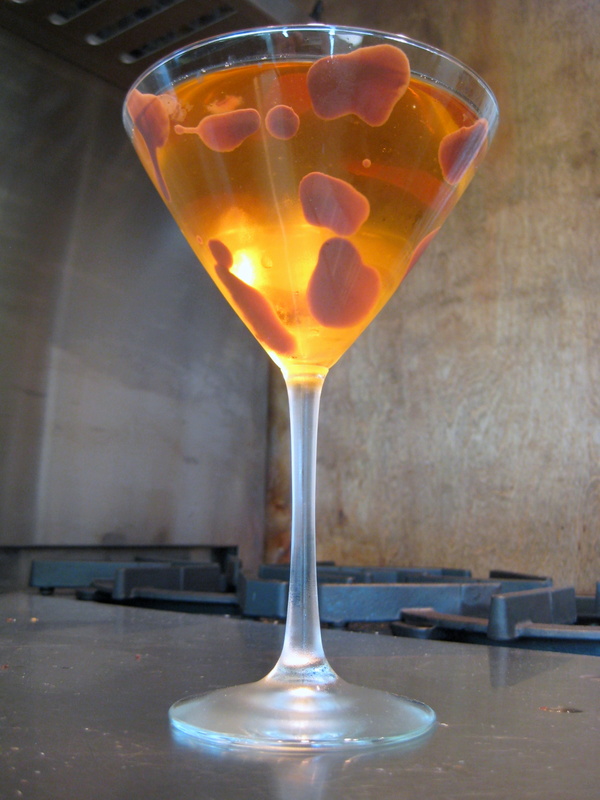 This drink is a fun and edgy interpretation of a martini with its deep amber glow and dark brown spots. It would be fun to serve at bunko, book club or a Mrs. Robinson themed party for adults some where in the range between kitten and cougar.